Todays picture isn’t something you should relate to Leonardo, yet the illusion is so simple, it makes you wonder how the unknown artist achieved such an extraordinary effect with nothing but mere letters. Look what happens if we rotate his “Black Cat” signature 90 degrees? 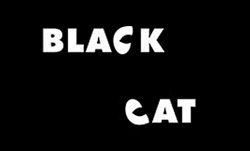 With just two inverted “C’s” you get an impression black cat is staring at you! Spooky, isn’t it? Brilliant. The simplicity of it is sheer genius! Fantastic! It always amazes me how things that are so simple can have such a magnificent effect. Very cool. would make a great font to use. I’m ashamed to admit i didn’t notice the eyes until they were pointed out to me. although i don’t really care for you saying da Vinci was the greatest inventor, because as well as the fact that there could have been many other unrecognized geniuses that never got the chance to use their talents, like someone stuck as a farmer his whole life, “genius” is such an ambiguous term that nobody has really figured out the exact definition of it, and really has more to do with creativity than intelligence. long winded, but the illusion is excellent! Cool, I can see it. Ooooooooooooooooo! Cool! I love the cat eyes! This one just jumped out at me O_o Good work! I like this alot, more similar would be excellent. 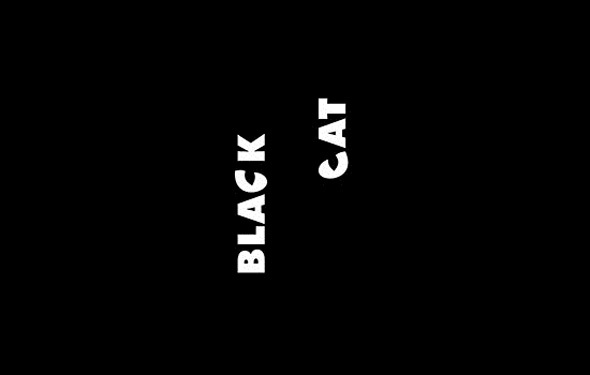 Is this really considered an optical illusion? Seems more like a graphic design gimmick, in my humble opinion. Oh yeah! I see it too! Pretty good! That is one of the best.